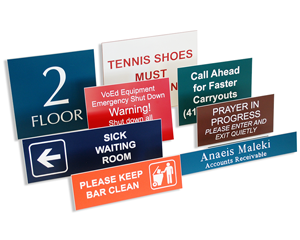 Have your say with this Custom 3" x 9" Engraved Select-a-Color™ Sign. Perfect fit for doors and walls. It was extremely easy to design, easy to purchase and got here super fast. I will definitely order from here again. Great Experience with a first time purchase! Exactly as I ordered and quickly! I am very happy with the 3 engraved custom labels. Just glued them in place and they look great. will definitely use you again if I need this type of product.